Saraswati Puja is right around the corner! 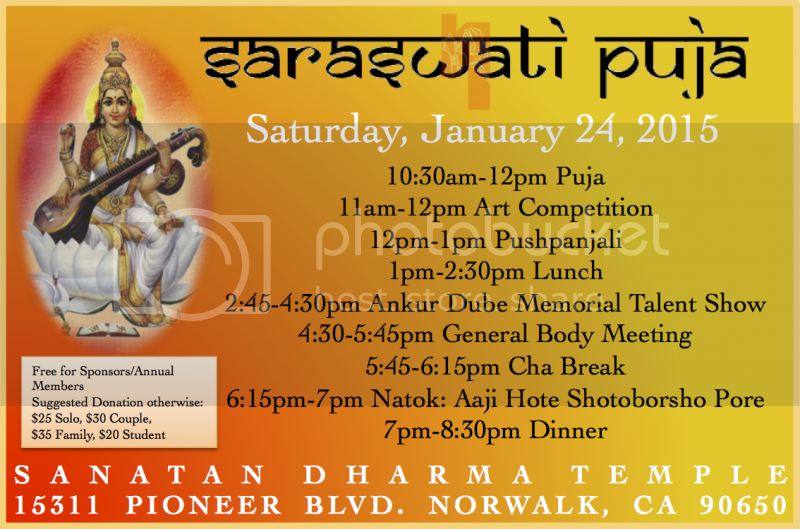 Please join us in observing the puja on January 24th at Sanatan Dharma Temple (15311 Pioneer Blvd. Norwalk, CA 90650). Thanks to all of the parents who have registered their children for the Ankur Dube Memorial Talent Show. This talent show is not a contest as we do not wish to create a sense of competition amongst our community children. Thus, cash prizes will be distributed to each participant along with certificates after the show. Also, kids who participated in Paduka Puran during Durga Puja last year will also receive their certificates. The show will begin at 2:45pm. We request everyone to please be seated by 2:30pm not only because we want to begin the show promptly, but so that the children's efforts do not go to waste. The children have been working really hard with each of their acts to showcase their amazing repertoire. They need your support and encouragement.